THIS IS POOL CODE! When unloading the product you need two able bodied individuals or a manned forklift, this does not include the driver. In most cases they will not help you unload the materials because it is not their responsibility. 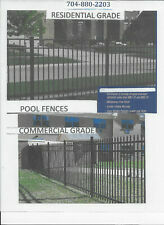 ALUMINUM FENCE / BEAUTY AT IT'S BEST / TOP OF THE LINE / PRICE,SERVICE & USA !! FREE QUOTES / SHIPS DIRECT/ MOST ORRDERS SHIP FREE!!!!! The pre-assembled puppy guard add-on panels are ready to install on most any new or existing aluminum fence, ranging from 3 ft. to 6 ft. high panels. The aluminum panels are protected with Armour Guard: a durable powder-coated finish, relieving your worries of chipping or cracking paint. ALUMINUM FENCE / RESIDENTIAL / COMMERCIAL/ HOMES-BUSINESS-SECURITY/ BEST USA ! TOP OF THE LINE PRODUCT / BEST SERVICE / BEST PRICING ! Vintage Cast Aluminum Fence Gate Topper Dog Cocker Spaniel. Condition is Used. Please look at all pictures before buying. Pictures are part of the description . Shipped with USPS Priority Mail. TWO Ester Williams Carousel Pool “FENCEs” Aluminum F6632GreatFindGood Condition! This item was used on a 24’ circular ester Williams Carousel pool. We have more than one fence available. You are viewing an excellent Ester Williams product opportunity, at a very reasonable price! Gate Corner Elbow Die Cast Aluminum 1-3/8". 4.5 ft. Vinings black gate provides an elegant and attractive solution to complete your aluminum fencing system. Gate features a flush bottom, not exposing the pickets for a sleek design. Includes two (2) gate hinges, one (1) self-latching gravity latch and required mounting hardware. The Clinton 1483 48 in. This gate will add beauty, elegance and security to your property. Included are a set 2 self-closing hinges and pad-lockable gravity latch. Gate Height (in.). Gate Width (in.). 4 ft. Vinings black gate provides an elegant and attractive solution to complete your aluminum fencing system. Gate is flat on the top and has exposed pickets on the bottom, providing a more secure enclosure. Our 4'X12' In-Ground Swimming Pool Safety Fence Is Designed Prevent Your Pool Area From An Accidental Drowning. Keep In Mind That Each 12 Ft Section Can Be Easily Shortened To Fit Your Pool Area Perfectly. Provincial 3 ft. W x 4.5 ft. H Black Aluminum 3-rail Fence Gate. 4-1/2 ft. height x 3 ft. wide walk gate. Rail length (in.). Gate Height (in.). Rail thickness (in.). Gate Width (in.). Gate opening width (in.). 5 ft. Vinings black gate provides an elegant and attractive solution to complete your aluminum fencing system. Gate is flat on the top and has exposed pickets on the bottom, providing a more secure enclosure. Veranda 5-1/2 in. x 7 in. x 9 in. Fence Aluminum Self-Closing Gate Hinge Kit. Condition is New. Shipped with USPS Priority Mail. 36 Linear Feet of 4' High x 6' Wide Aluminum Fencing. Long-lasting and maintenance-free fencing. Since 1951. Carolina Style Alternating Picket, Flat Top. TuffBilt Beechmont Heavy-Duty 4 ft. W x 4 ft. H 2-rail pre-assembled aluminum fence straight gates arrive pre-assembled to match your TuffBilt aluminum fence. Pre-assembled gates include Boerboel hinges. 180 Linear Feet of 4' High x 6' Wide Aluminum Fencing. Long-lasting and maintenance-free fencing. Since 1951. Carolina Style, Alternating Picket, Flat Top. 90 Linear Feet of 54" High x 6' Wide Aluminum Fencing. Long-lasting and maintenance-free fencing. Since 1951. Georgia Style Flat Top 3-Rail. 15 - 54" High x 6' Wide Sections - Black. 180 Linear Feet of 4' High x 6' Wide Aluminum Fencing. Long-lasting and maintenance-free fencing. Since 1951. Georgia Style Flat Top 3-Rail. 90 Linear Feet of 4' High x 6' Wide Aluminum Fencing. Long-lasting and maintenance-free fencing. Since 1951. Texas Style 2-Rail Flat Top. 180 Linear Feet of 54" High x 6' Wide Aluminum Fencing. Long-lasting and maintenance-free fencing. Since 1951. Georgia Style Flat Top 3-Rail. 30 - 54" High x 6' Wide Sections - Black.